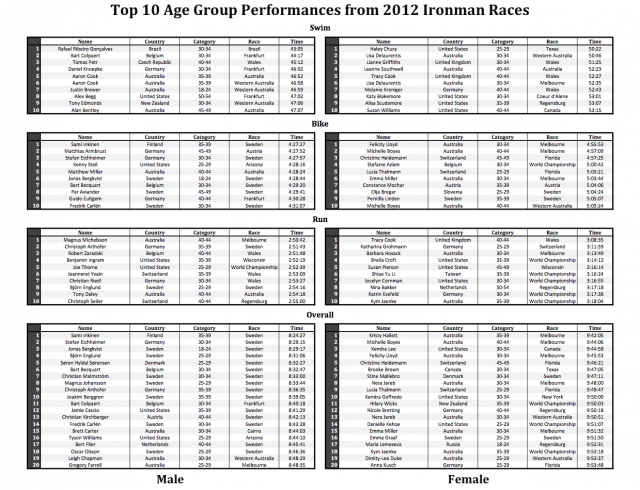 The criteria remained the same, New York was excluded from the swim, but among the age group results the quality of data was much lower. 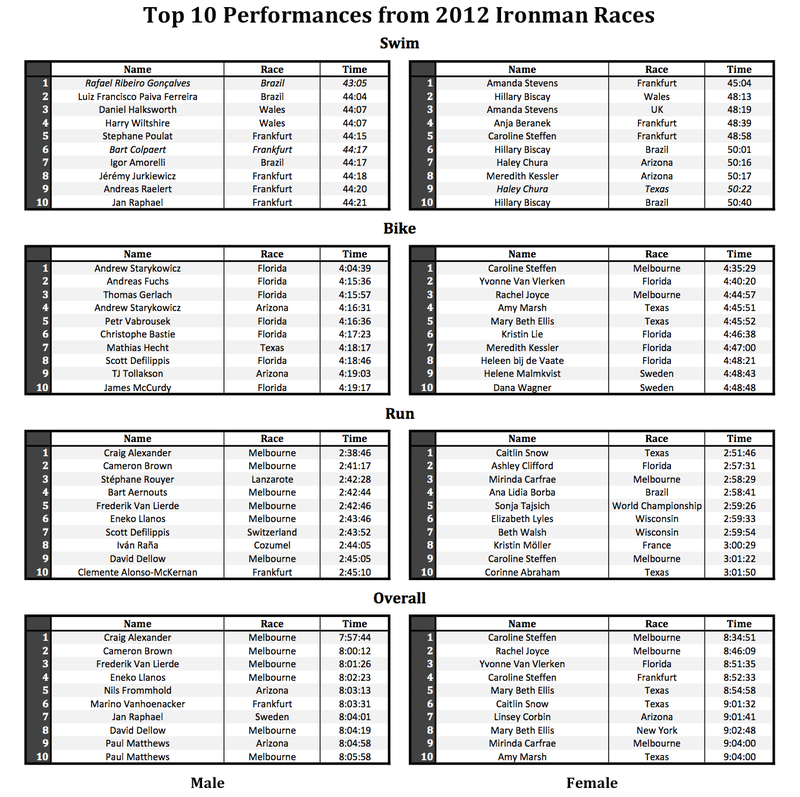 I removed obviously suspicious results such as 3:50 bike splits and 2:10 marathons; then I did my best to confirm the top results – checking the full splits for erroneous timings and searching Google for athletic histories. To the best of my knowledge the tables above are correct, but there is a risk that I have accidentally removed a legitimate result or left a bad data point in place. I am certainly more aware of the workload that will be involved in verifying all of the 60,000 records in the database. 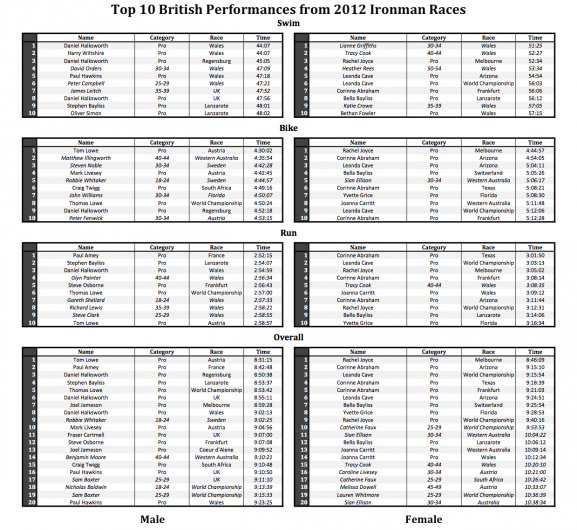 The British pro field is relatively small so many more age groupers (highlighted in italics) make it into the top 10 performances. This was the hardest data to clean and a number of fast transitions have been rejected where the athlete in question was an extreme outlier. 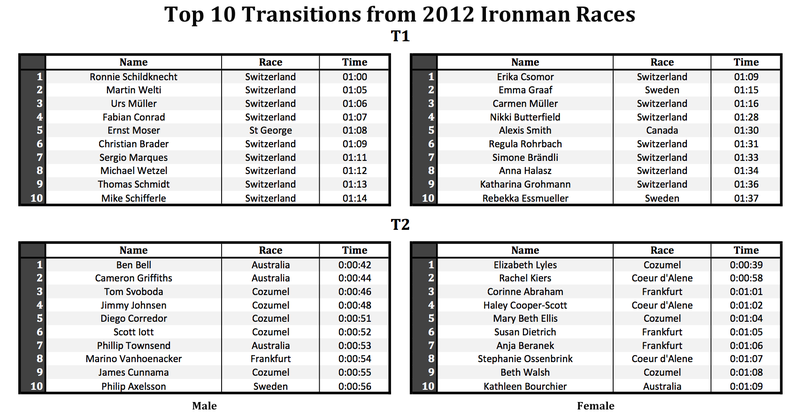 I didn’t believe transitions of only 1 or 2 seconds, nor did I believe transitions that were so much faster than anyone else at the race. 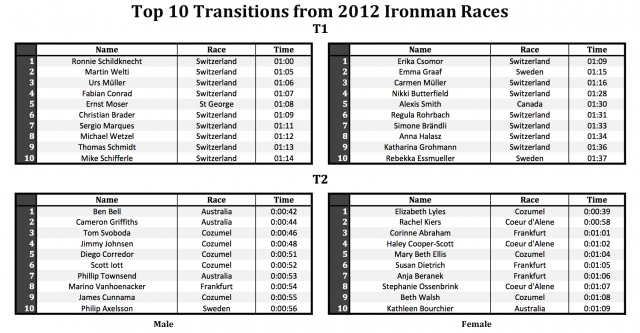 Switzerland with its traditional racking instead of the Ironman race bags dominates. 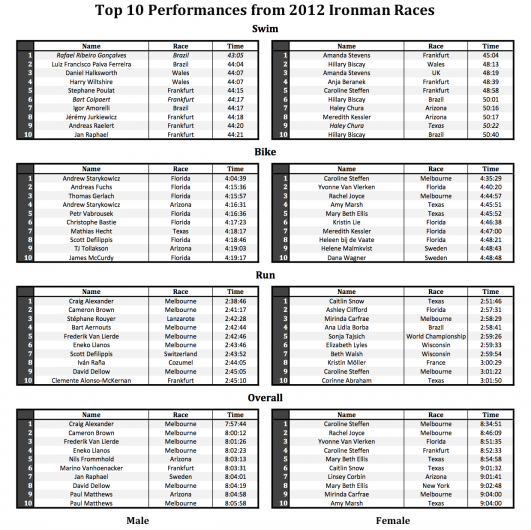 There are huge shortcomings to unadjusted comparisons across races, Thorsten’s Triathlon Ratings does a far better job of ranking the pros. These are the fastest times without consideration for course or conditions; I have been selective in their construction – removing New York from the swim, and manually determining the authenticity of some results. 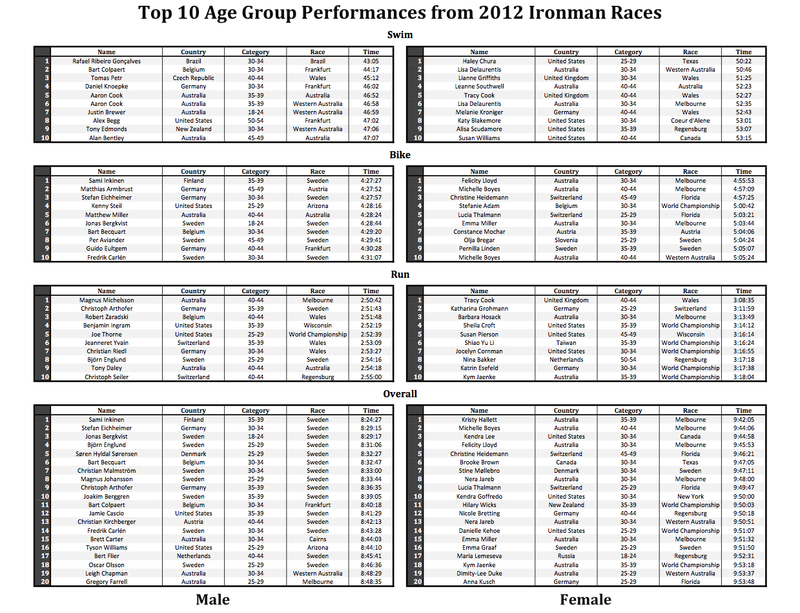 In the process I did ponder the prospect of simulating the Ironman Age Group Rankings system for every athlete, but that would require some serious work to match athletes across races. 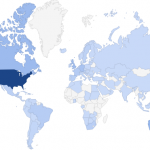 There is still more to come from this data. 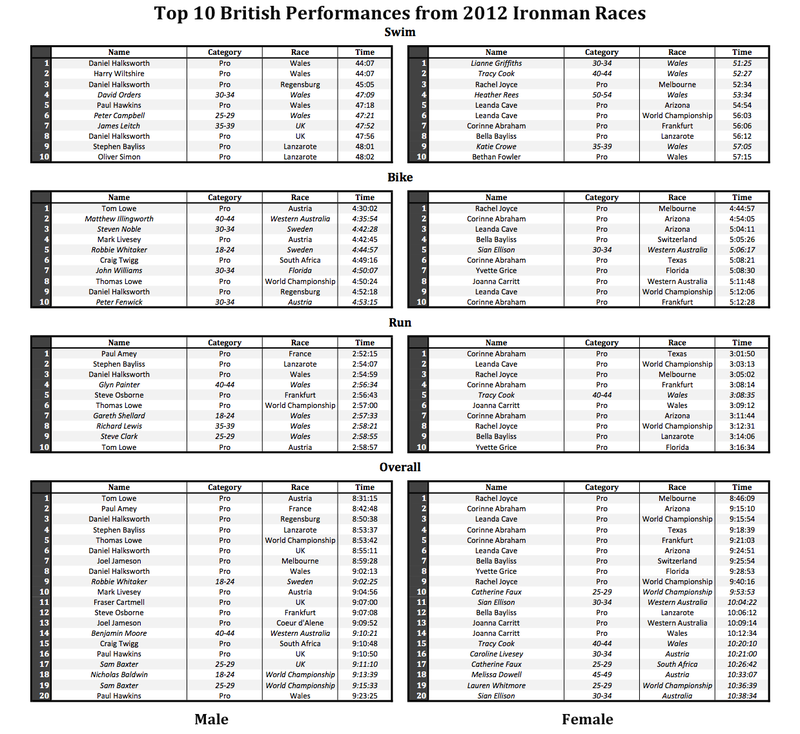 Also produced from my Ironman results database is this interactive map of the world showing athlete counts by country and fastest, average and slowest performances by country too.